“The humble patio is so much more than the sum of its parts. In Austin, it’s practically a lifestyle. Give us a covered space, open to the great outdoors, with a place to sit, eat, and drink, and we’re there. Make it offhandedly stylish with just enough tony luster, then add potent cocktails and super flavorful comfort food? Expect us to pretty much move in. 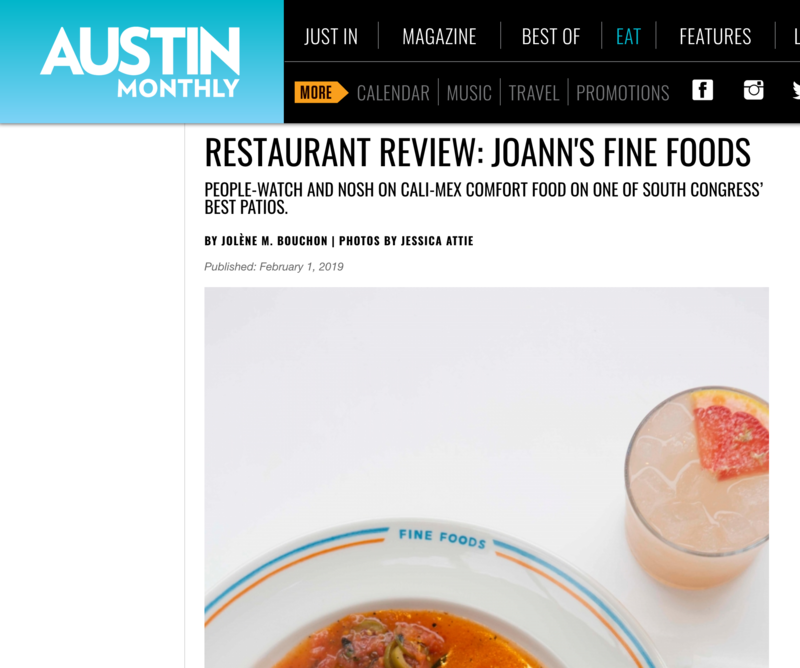 “That’s basically the vibe at Joann’s Fine Foods, Austin Motel’s new resident eatery run by McGuire Moorman Hospitality. (If you already knew that the restaurant group manages Perla’s, June’s All Day, Jeffrey’s, and Josephine House, the space’s effortless chic won’t be a surprise.) The changeover happened after longtime fixture Snack Bar declined to renew its lease and Austin Motel was renovated. The result is a restaurant with a breezy retro flair and a relaxed Cali-Mex menu.